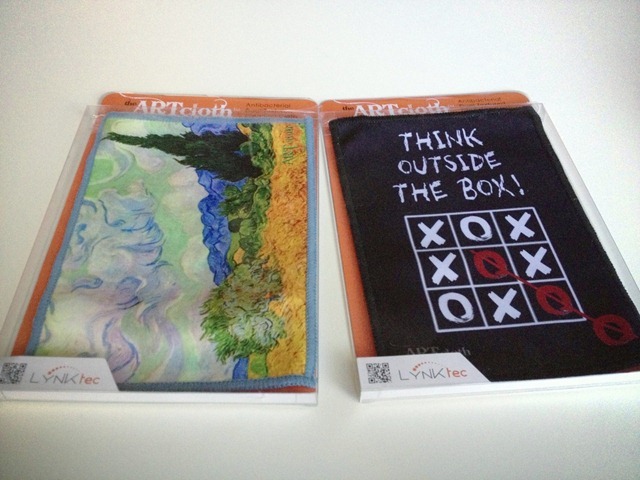 These review units of the ARTcloth cleaning cloths for the iPad just arrived today. The packaging is quite nice, and I have to say I like the idea of putting a bit of artistic flair into a pretty mundane iPad accessory. ARTcloth is aimed at screen cleaning for iPads, tablets, smartphones, laptops, digital cameras, gaming devices, and more. — Dual-Textured: Soft side easily removes smudges, oil and dirt. Silky side for buffing. — Reusable & Easy to Clean: Machine washable, cold. Tumble dry, low. I’ve only just taken one of these out and given it a very quick initial test on my iPad mini. It worked quite nicely. I’ll try these out a lot more and then post more thoughts on them. In the meantime, if you’d like to see more details or place an order check out the ARTcloth product page. Another good choice is the one I’ve been using for 2 years. At any Wallmart with optometry store. They sell the cloths for $2.27 and they work great.